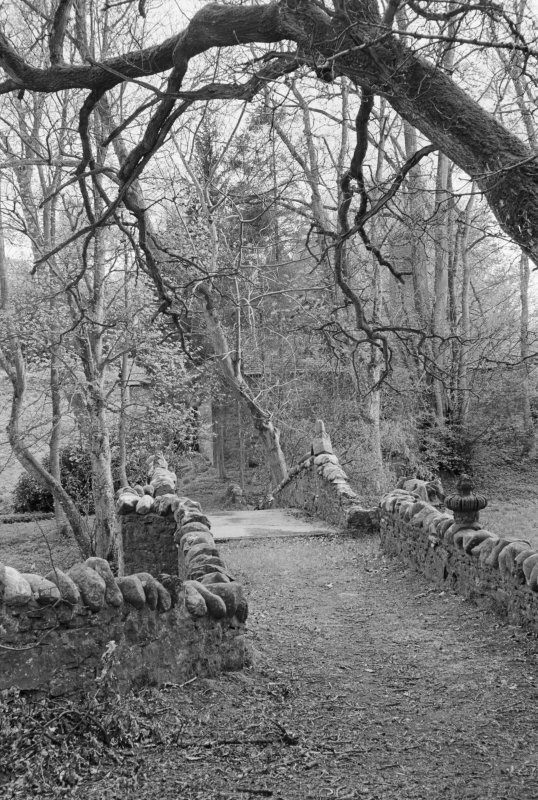 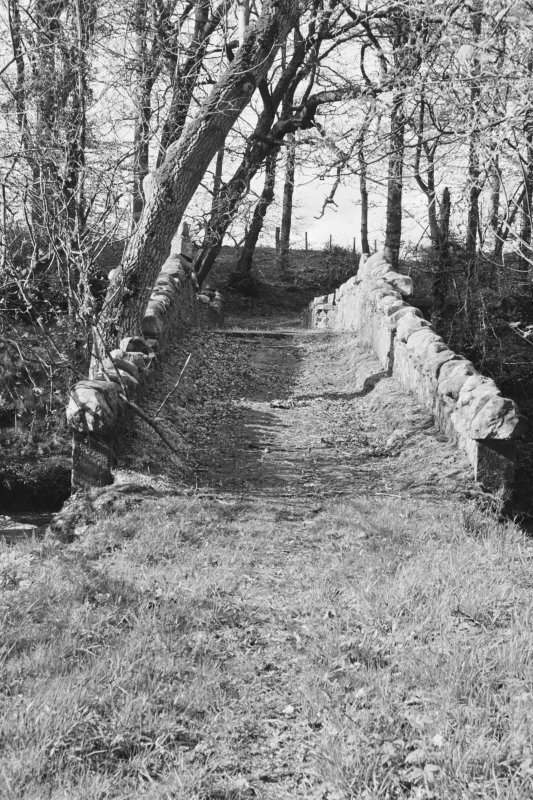 General view along deck of Old Bridge of Dean. 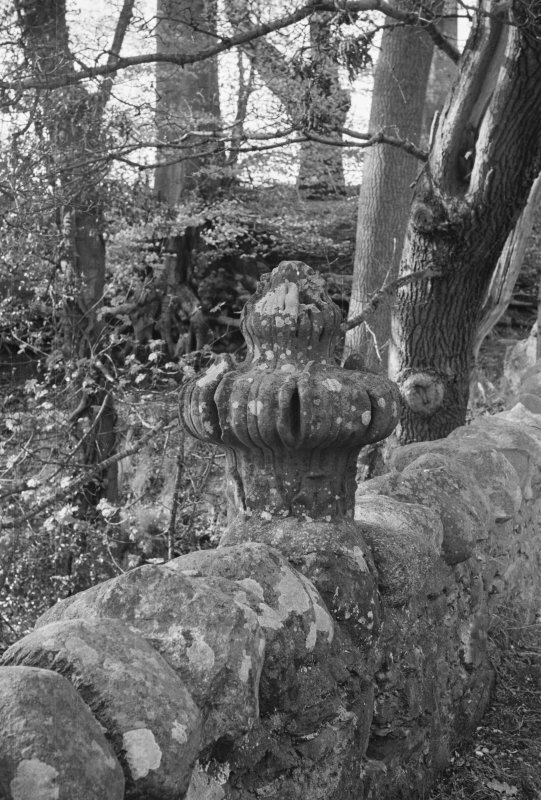 Detail of stonework on parapet, Old Bridge of Dean. 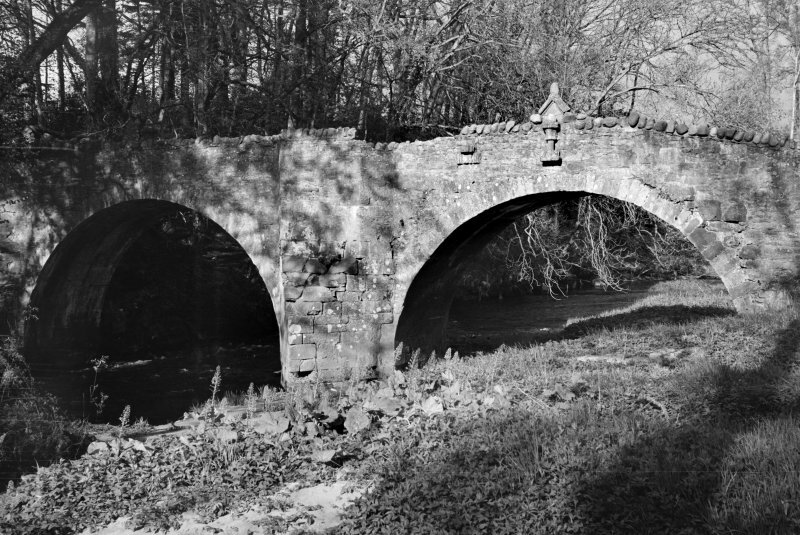 General view of Old Bridge of Dean. 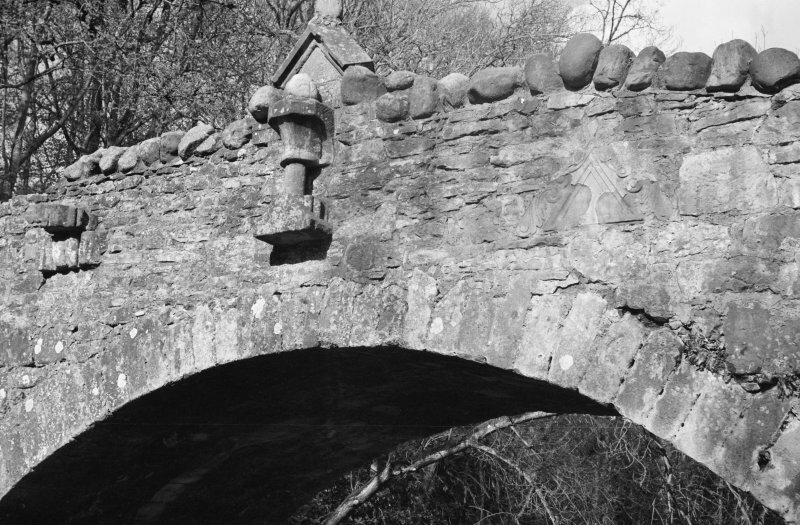 Detail of stonework, Old Bridge of Dean. 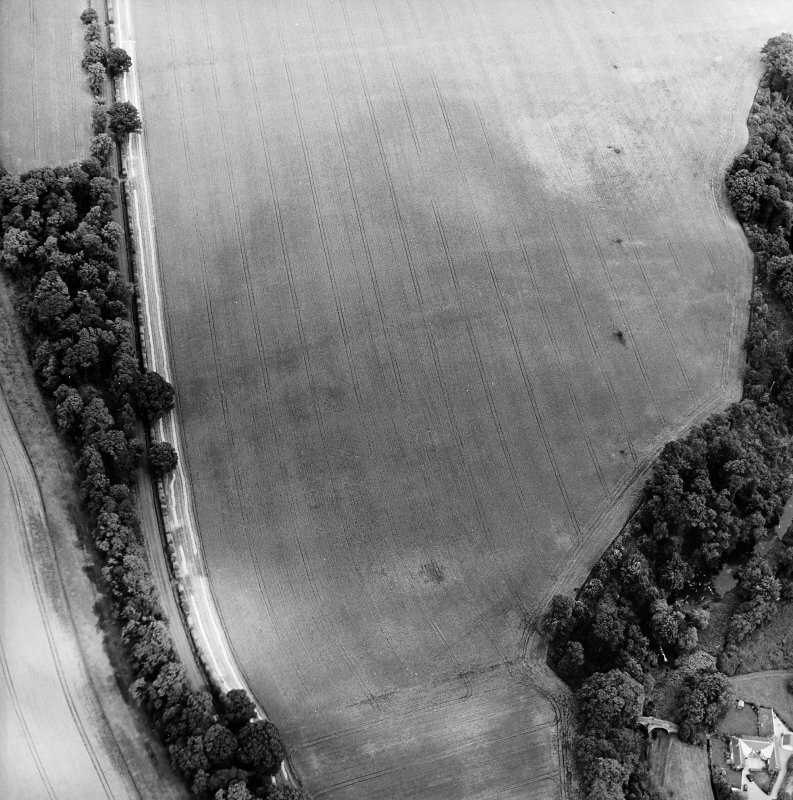 Oblique aerial view centred on the cropmarks of the fort with the bridge adjacent, taken from the WSW. 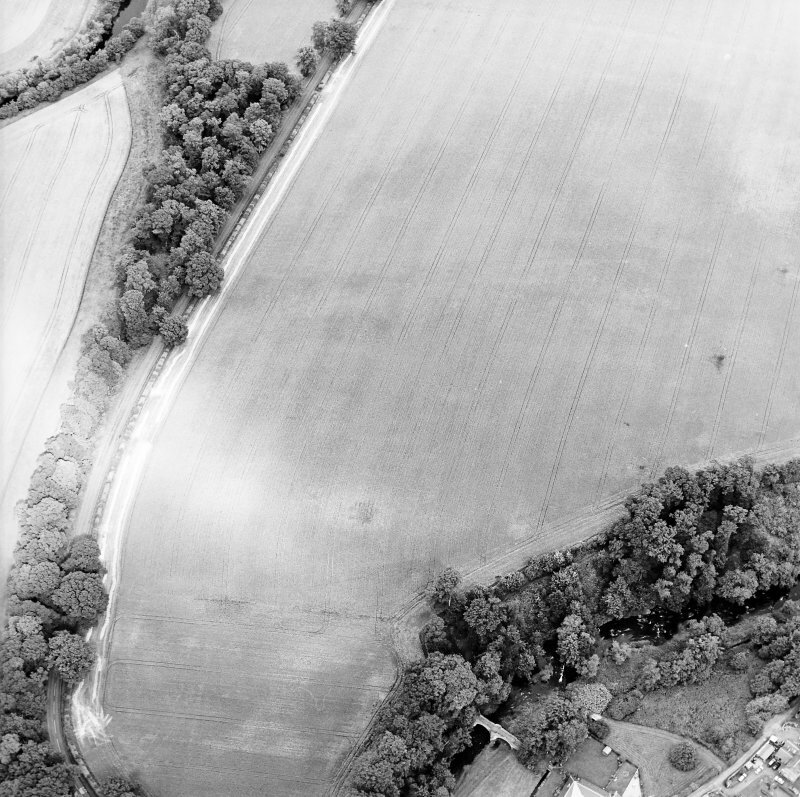 Oblique aerial view centred on the cropmarks of the Roman Fort with bridge, road bridge and watermill adjacent, taken from the SW.
Oblique aerial view centred on the cropmarks of the fort with the bridge adjacent, taken from the SW. 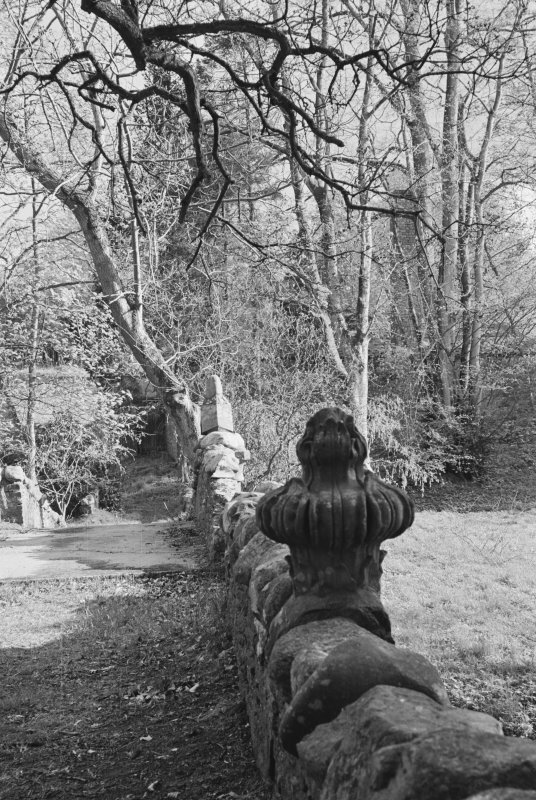 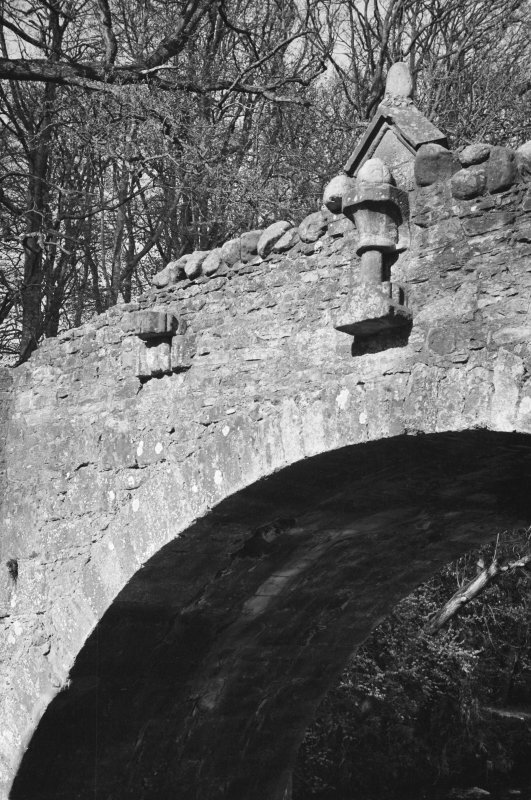 Detail of stone work, Old Bridge of Dean. 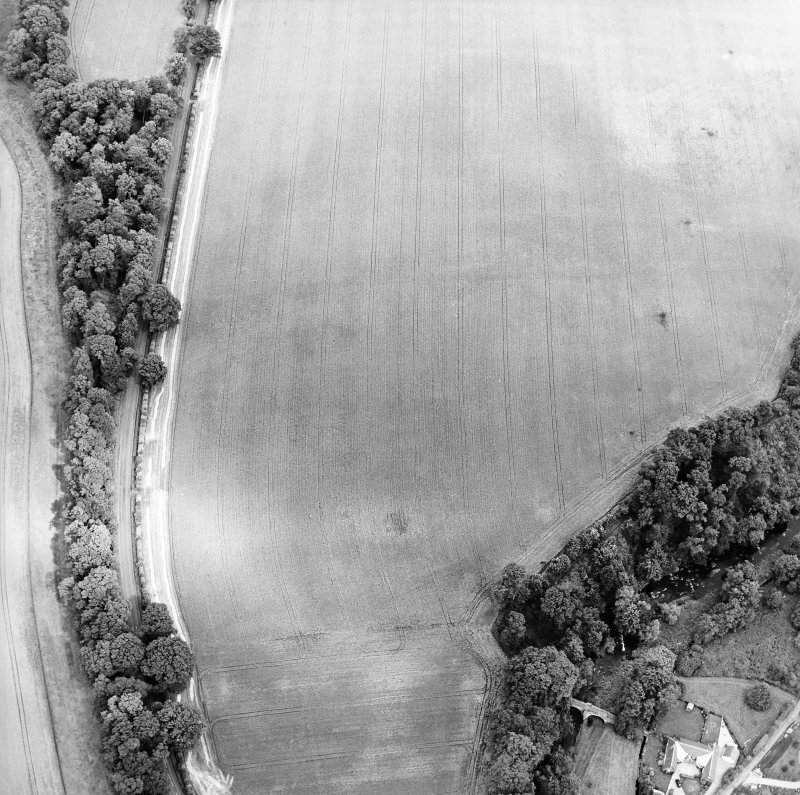 Oblique aerial view centred on the cropmarks of the Roman Fort with bridge, road bridge and watermill adjacent, taken from the ESE. 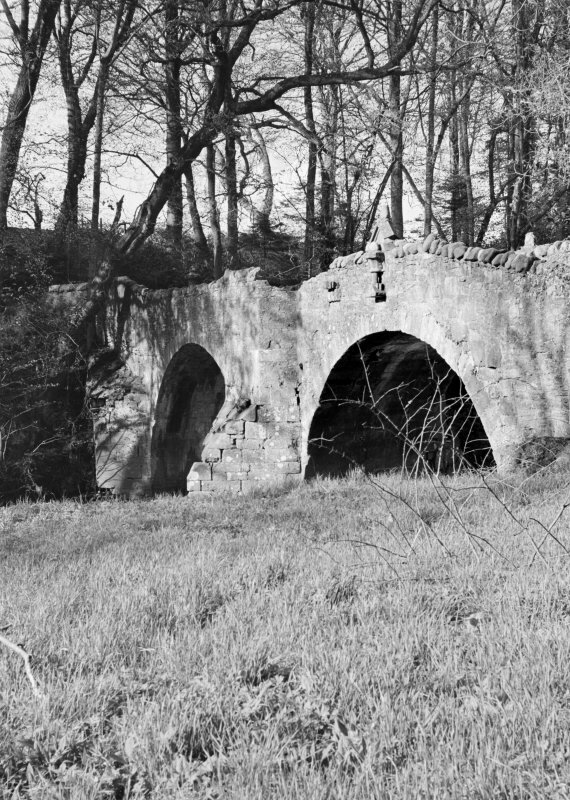 Old Bridge of Dean View of bridge from South-West. 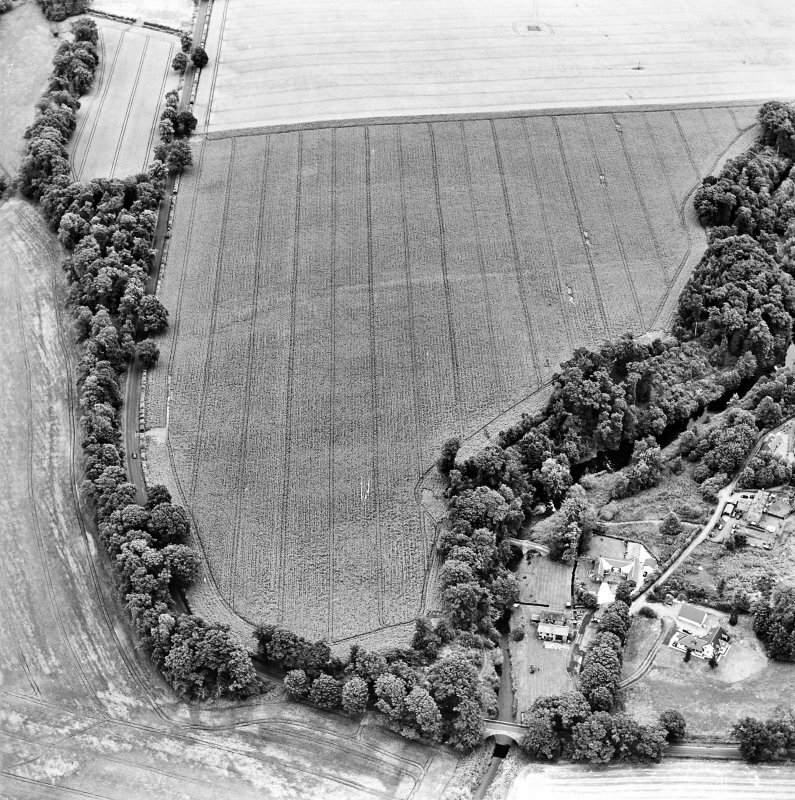 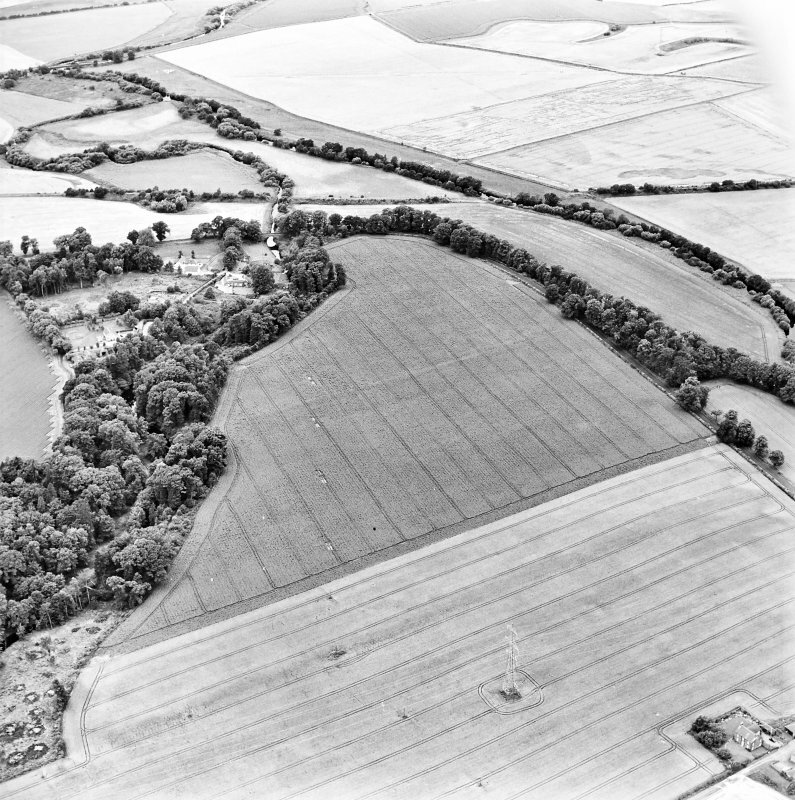 Oblique aerial view centred on the cropmarks of the Roman Fort with bridge, road bridge and watermill adjacent, taken from the E.
For incorporated architectural fragments, probably from Coupar Angus abbey (NO23NW 13), see NO24NE 13.01. 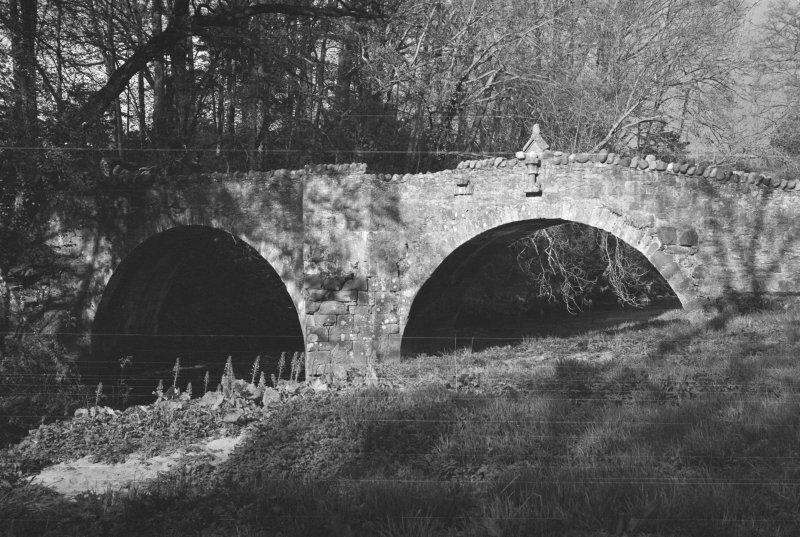 For the New Bridge of Dean, see NO24SE 67. 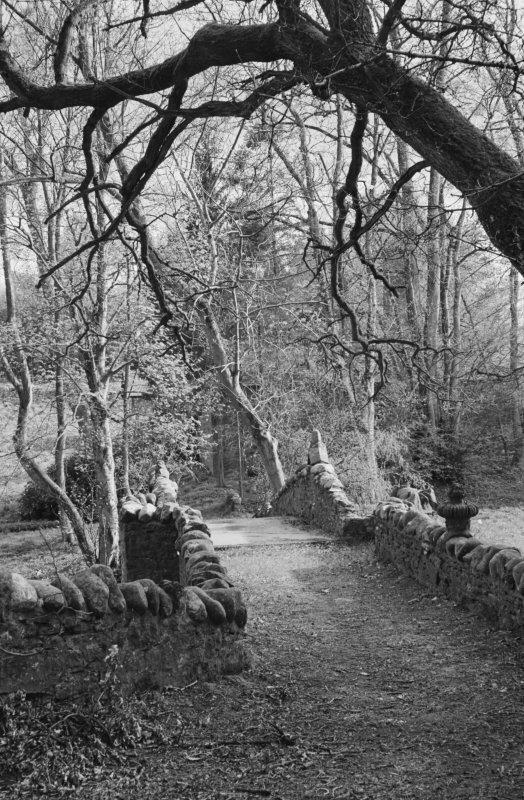 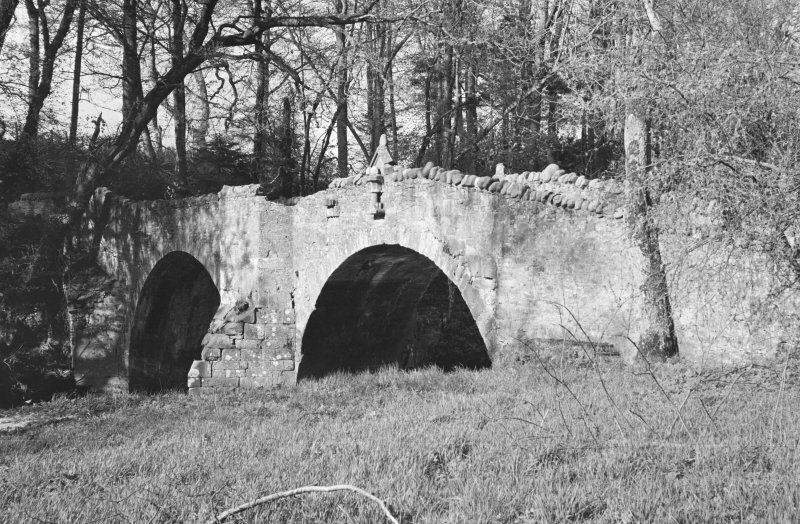 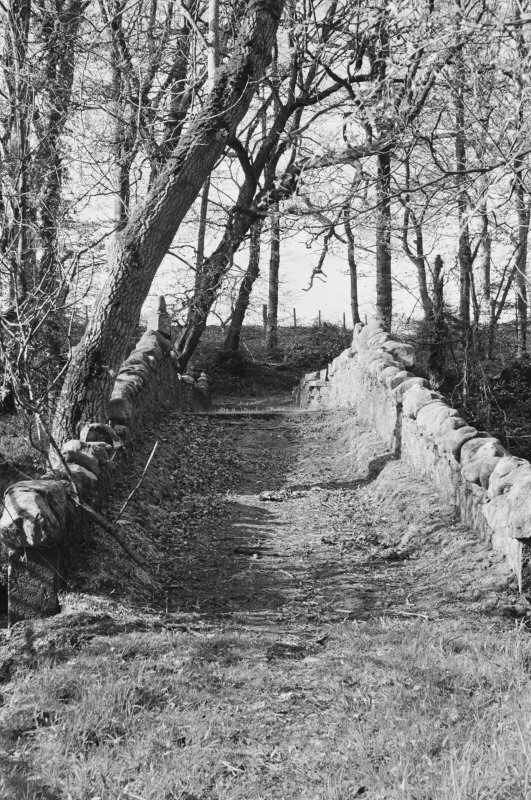 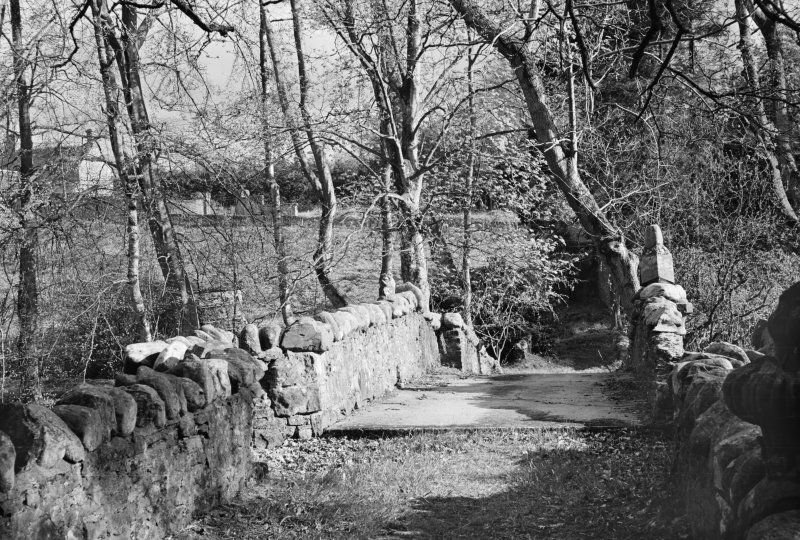 The Old Bridge crosses the Dean Water between the parishes of Airlie and Meigle. 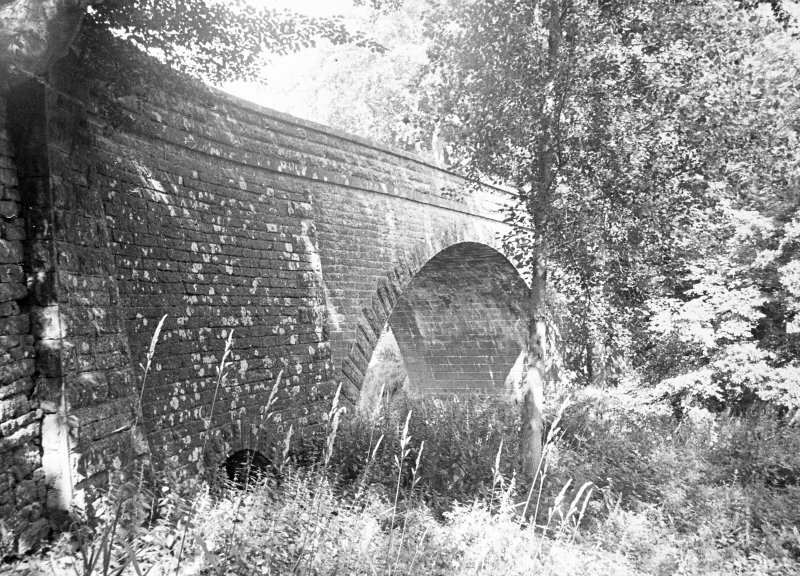 (NO 2878 4587) The Old Bridge of Dean has two semi-circular arches with a central cut-water carried up to refuges. 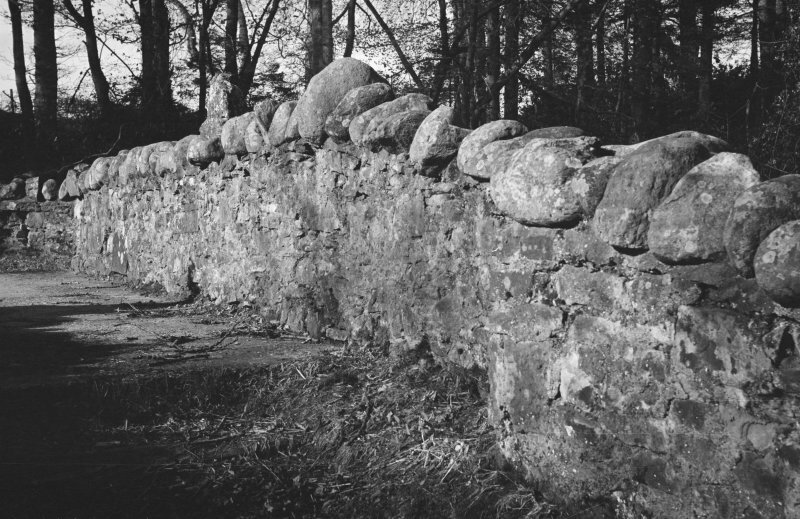 It is 9' wide with its E parapet corbelled while the W has inset medieval stones. 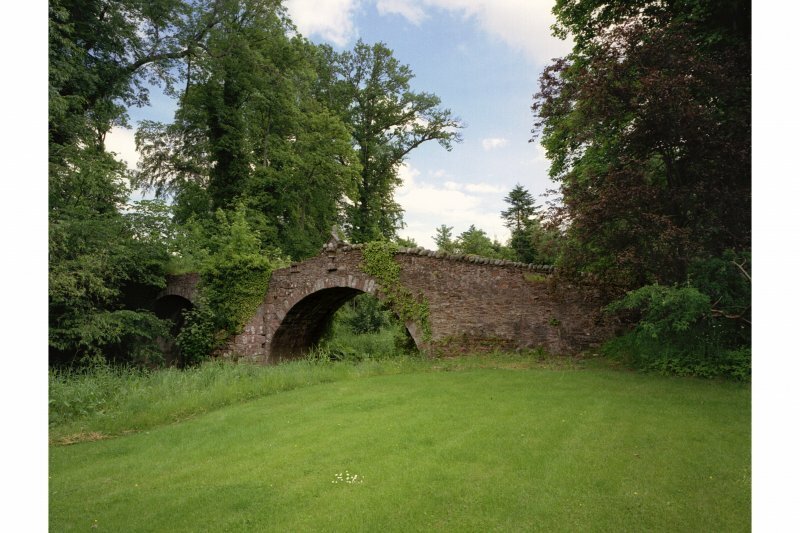 It dates to the 17th century or earlier, though the N arch was rebuilt late in the 19th century. 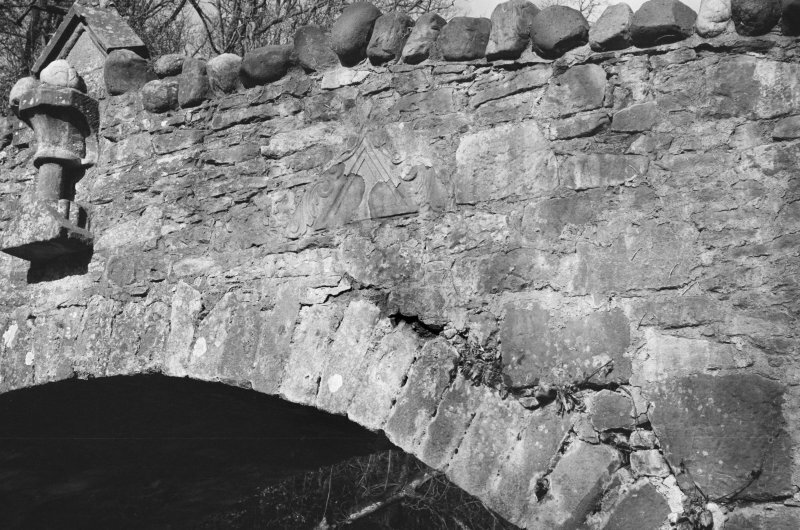 The N span has been broken, apparently by blasting. 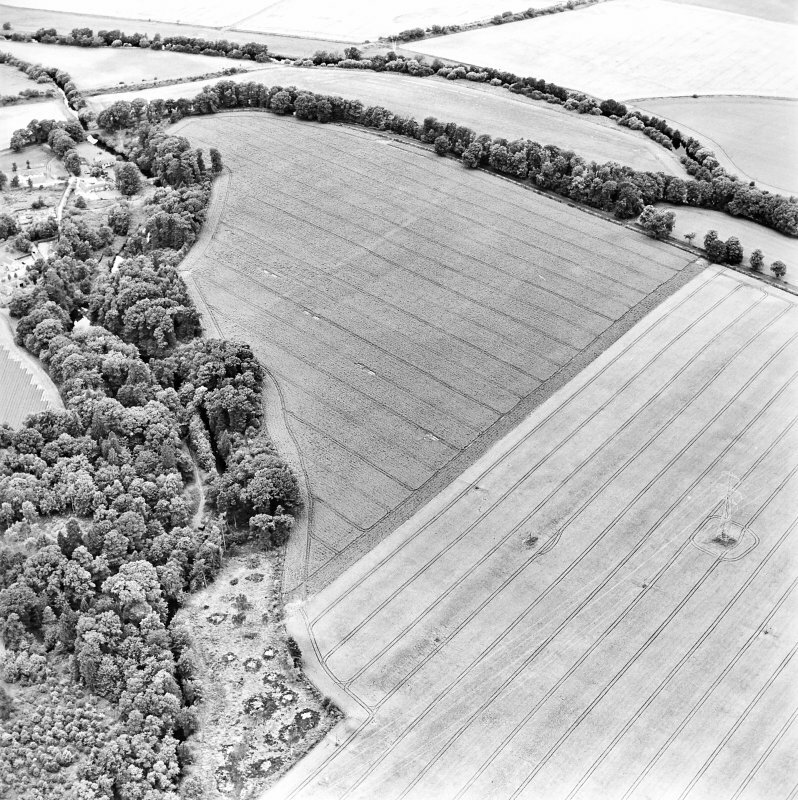 Information from RCAHMS (IMS) 26 June 1990. 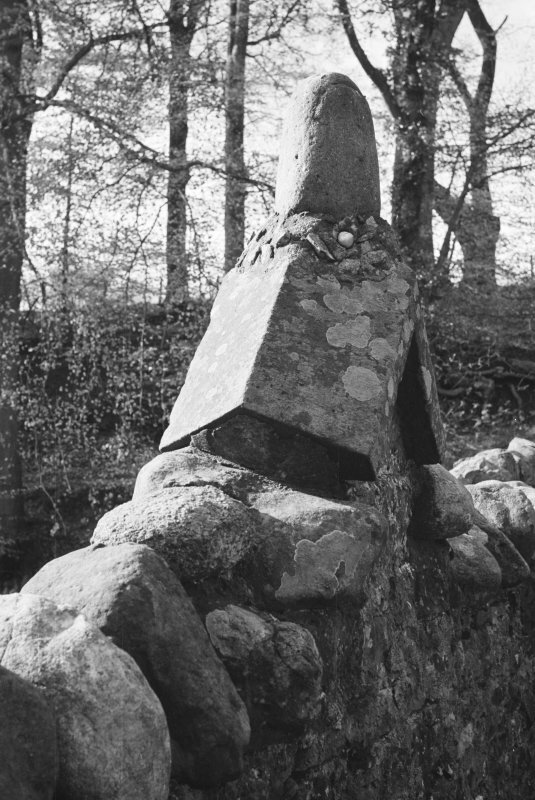 (Location cited as NO 287 458). 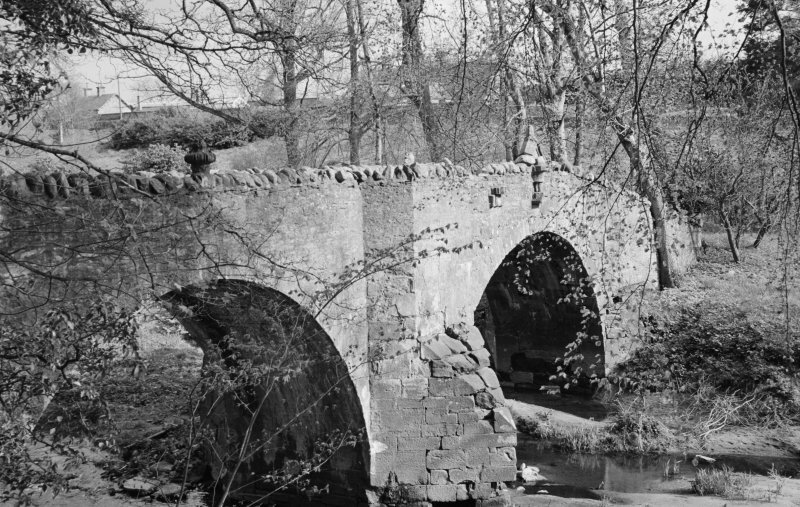 Old Bridge of Dean, probably 17th century, reconstructed 1878. 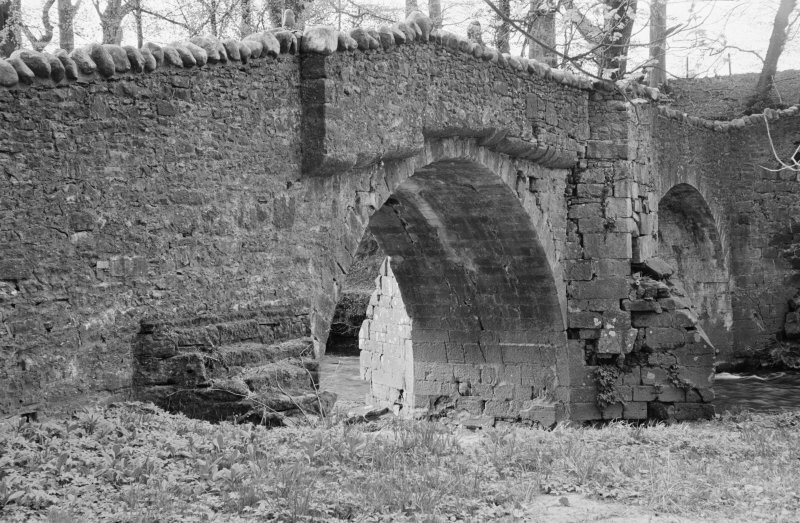 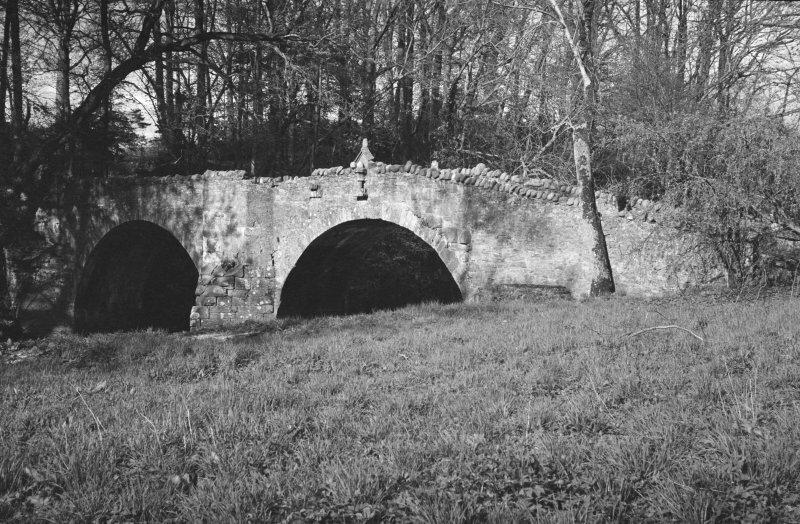 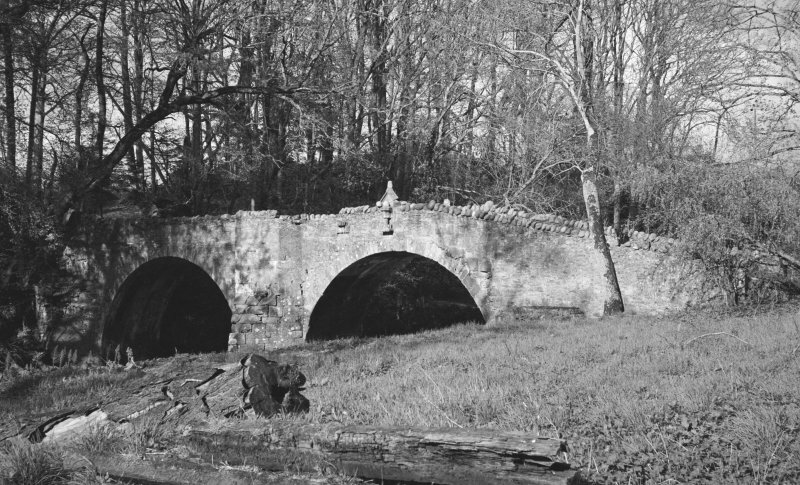 2-span rubble bridge with semicircular arches and triangular cutwaters which may have been used as a pack bridge. 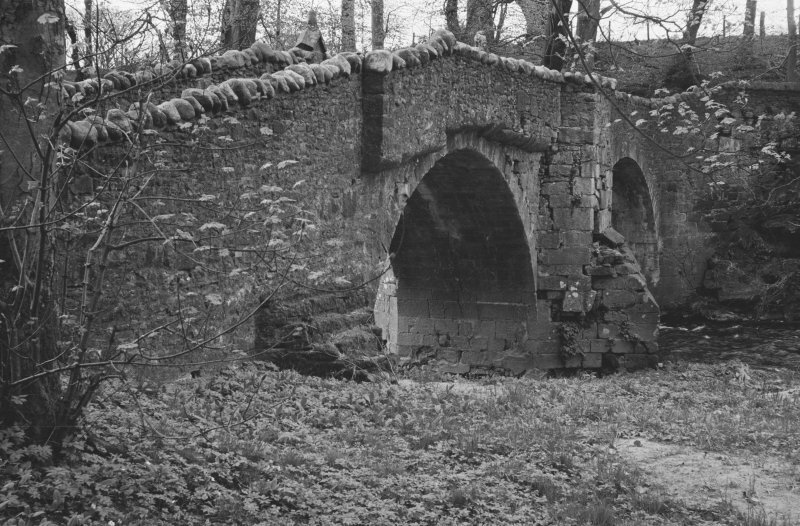 Photographic survey by the Scottish National Buildings Record in May 1963.